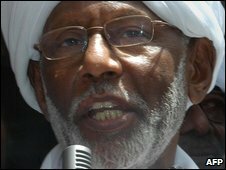 Sudan's Islamist opposition leader, Hassan al-Turabi, has been prevented from travelling to Paris for medical treatment, an aide says. Mr Turabi had a travel permit from the interior ministry but was stopped at Khartoum airport, the aide said. The leader of the Popular Congress Party was released from prison in March after two months in custody. He was held after calling on President Omar al-Bashir to surrender to face charges of war crimes in Darfur. Mr Turabi, 77, a proponent of Sharia law, was once a close colleague of Mr Bashir but he lost out in a power struggle between the two in 1999. "Turabi had obtained permission to travel from the interior ministry and a boarding pass, but several security men came and took his passport... and returned to tell him that he was not permitted to leave," Mr Turabi's office manager, Awad Abu Bakr, told AFP news agency. He did not specify any details of Mr Turabi's planned medical tests. The International Criminal Court issued an arrest warrant for Sudan's president in March.